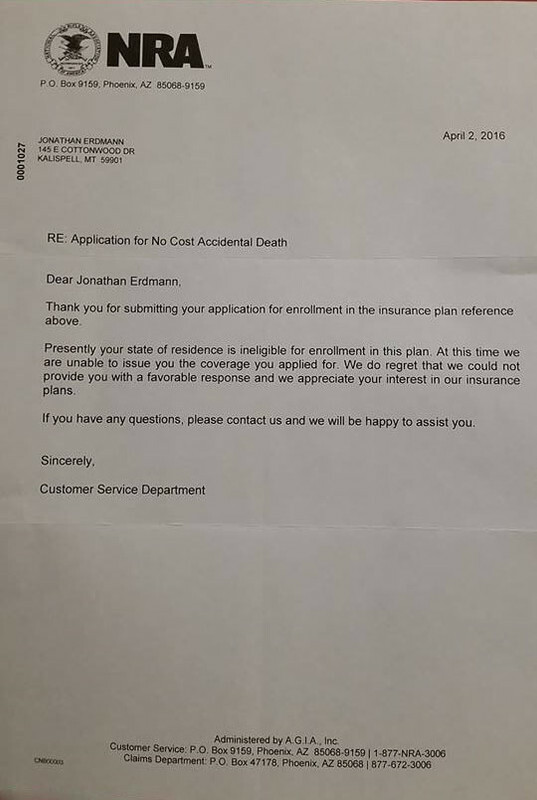 And so, the NRA had promised it's membership, that I/we would get this No Cost Accidental Death Insurance as part of my membership. I got this letter back in 2016. .... they will not be getting a renewal from me, as a result. The next thing they will be sending out, is that the other grantees are no good as well. This was the insurance for incidents relating to traveling to NRA events or at NRA sponsored events? The accidental death insurance is for coverage even at home, range etc. It was a major perk from the NRA for all members. So they get a big from me. Blame your state J_B, not the NRA. I'm covered in Kansas. I don't look for perks from the NRA. I respect all the fighting they do for gun owners and that's good enough for me. Rman, maybe I should have used the word "Benefit" instead of perk, as it was one of the benefits of joining the NRA. It was up to them to provide it, and if it wasn't available for Montana residents, then it was up to them to write a disclaimer to the effect. It was up to them to provide it, and if it wasn't available for Montana residents, then it was up to them to write a disclaimer to the effect. I agree with rman, blame the state. I bet somewhere in really fine print there was a disclaimer of sorts. You got me looking at NRA benefits, particularly the gun loss. I wasn't all that interested in the accidental death. I remember getting a lot of mail about those benefits. I went to the NRA website to look up the status insurance in VA. I don't think they offer it anymore. I don't spend any time on the NRA website, and don't really look at their sales/donate/etc mailings. I'm a life member so I don't go through renewal. Some of the morning's entertainment will be figuring out what, if any, insurance benefits accrue from my being an NRA member. They very well told me a few times and in a couple places about the change and I ignored it. I never joined NRA for insurance. I want their activism on gun rights. Pre-Heston, I quit the NRA because they got pretty weak on response to 2A assaults and rejoined after cold dead hands. I'm going to call NRA and figure out what I may or may not have.